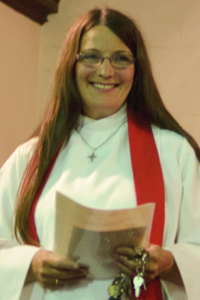 Having studied English Literature and Language in at Sydney University, Anastasia Webster-Hawes never dreamed she would become an Anglican priest. But it was at a residential school while studying her Bachelor of Theology at CSU that Anastasia had her ‘Aha’ moment. The first female Rector of the Anglican Parish of Blayney in Central West NSW, Anastasia now spends her time helping her parishioners, promoting social justice issues on social media and taking care of her beloved family. Here Anastasia shares how being a priest has allowed her the opportunity to help others. I am the only child and neither parent was educated beyond fourth form. I studied a Bachelor of Arts and Master of Arts before the Bachelor of Theology and I think my father was bemused by me, but awfully proud. He died before I was ordained. I think my mother was startled - she did not believe in women priests, and I’m not sure if she does now either! I’m currently… the Rector of the Anglican Parish of Blayney, which includes seven churches in little country centres in the Central Tablelands of NSW. I’m the first female rector in the 140 year history of the parish. In my profession it is important to… have an open, thoughtful mind, although not everyone would agree with that. I’m passionate about loving people and sharing and showing God’s love. Being a priest means you can touch people’s lives, have deep relationships, help people who are hurting, have an opportunity to speak out on things that matter in the world, and even be an agent of change. I chose CSU through divine serendipity. You could call it pure good luck – but it was exactly the right place at the right time for me. My best experiences at CSU... was the thrill of winning the inaugural Marie Louise Uhr Prize for a female theology student and also finding to my surprise that I had won the top academic award at graduation. My worst experience at CSU... running late with assignments. At university I was inspired… when sitting in my first THL101 residential school class I had a mighty great ‘Aha!’ moment: This was it! Today I’m motivated… to keep on questioning and learning. The biggest influence in my life... my kind and loving grandmother. I indulge in Facebook. Friends like my personal posts regarding life generally, but they probably get annoyed by my political and social justice bandwagons. The single-most important issue in the world is… a hard question. I think of inequality and injustice, which takes in rich/poor, overabundance/nothing, power/powerlessness, and all the misery these cause to people, to societies, to the planet. If I could do it all again... I would try to avoid making very many mistakes. I cannot at all relate to people who say, ‘I’d never change anything’! One last thing... I love animals and my family. I have four cats, two dogs, two chooks, eight kids, and one husband.